Take a look at some of the largest companies in the world–Apple, Nike, Walmart, Toyota–and you’ll find some of the most sophisticated, complicated supply chains. Today, consumers and shareholders alike are taking a deeper look into these supply chains and asking for businesses to increase visibility and promote responsibility throughout its networks. Supply chain leadership has to ask themselves: Are we focusing enough on sustainability and corporate social responsibility (CSR)? 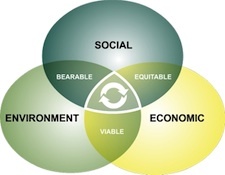 The following five areas of focus are important for supply chain leadership to connect CSR and sustainability in order to improved margins, reduce costs and lead to more responsible operations that hold a greater respect for our Earth and its citizens. Improve Sustainability Measurement. An important task for supply chain leadership is to accurately connect sustainability project costs and the impact on operations, costs and profits. Not only is it crucial to to prove this to decision makers, but it’s also beneficial in gaining greater insight into the supply chain and the business, in general. Ask Suppliers to Become More Sustainable. Monica Gelinas, sourcing expert and principal at GritWork LLC, believes that businesses should extend an “olive branch” to suppliers and work together to improve efficiency and sustainability. The result will be lower costs for the business, and thus the consumer, as well as create more eco-friendly production. Improve Sustainability at the Level of Product Design. Improving sustainability at the level of product design leads to a positive downstream impact on entire supply chain–from production to transportation. For example, many cleaning product companies have moved to concentrated formula products that reduce production and transportation costs. In turn, these companies also have a sustainable initiative that their marketing team can build around. Avoid Socially-Irresponsible Suppliers. Nike came across this problem in the 1990s when child labor was found within its manufacturing plants. More recently, suppliers of the toy manufacturer Mattel were found to be shipping products with dangerous levels of lead paint. (The fallout cost the company $100 million in recalls.) Today, CSR is more than just a marketing ploy by brands–it’s a risk management strategy. Find Employees that will Drive Sustainability. While technology has improved the sophistication and execution capabilities of these business’ supply chains, effective and impactful sustainability requires leadership that can develop and drive sustainability throughout the business. “Companies need to figure out that it’s worth putting its ‘good people’ on these issues to realize eco-efficiency,” says Diane Osgood, Ph.D, of Osgood Sustainability Consulting. What other ways can businesses improve sustainability among their supply chains? Michael Koploy is an ERP Analyst at SoftwareAdvice.com, an online company that reviews transportation management systems. You can reach Koploy on Twitter at @SCMAdvice.